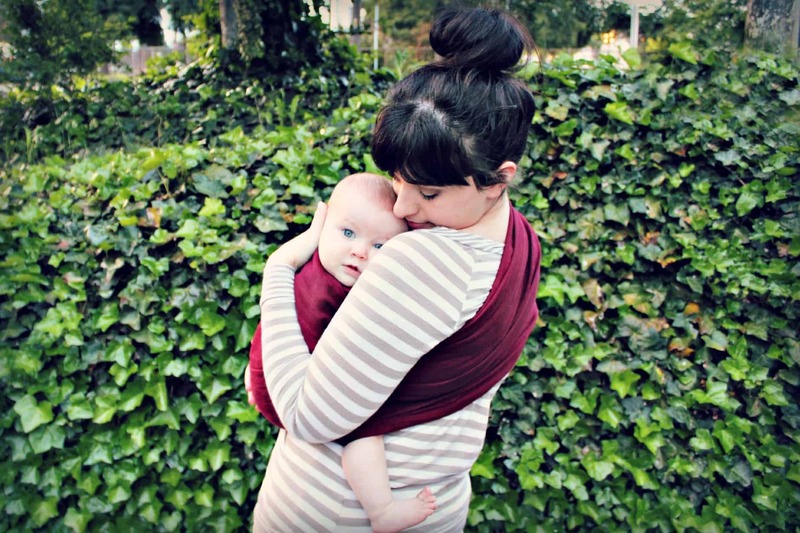 We love ring slings because they carry baby in a natural and comfortable hip carry, are super fast to put on and take off, have great “poppability” and can be shared by babywearers of different sizes. 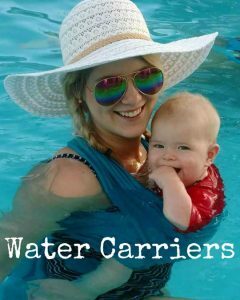 While ring slings are very simple to use once you get the hang of it, they are also a baby carrier that many parents give up on. Why? 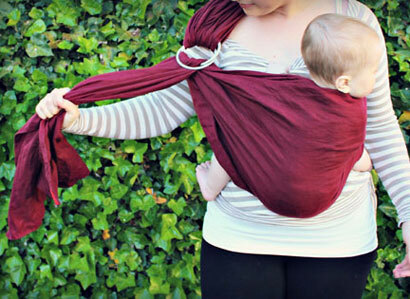 Because many new babywearers don’t have someone around to give them a few hints on how to make their ring sling work! If this describes you, then search no longer! 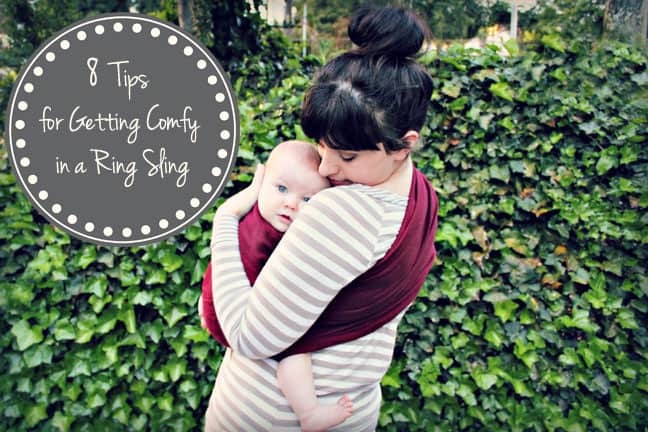 Here are the our 8 easy tips for getting comfortable in your ring sling. P.S. If the sling you are using doesn’t adjust so that you can achieve the pictured positioning, please consider getting a new sling! Shop our selection of ring slings. Tip 1 – Make sure you are wearing the ring sling as high and snug as possible, with baby’s head at the level of your upper chest. Do Wear Baby high, snug and in an upright position (unless nursingin the ring sling). Your positioning should mimic you holding the baby in your arms. An infants head should be resting on your chest, while an older baby or child’s head will be higher. Newborn safety must: baby’s head , mouth and nose are visible at all times and never covered by the ring sling fabric. Don’t wear your child with his bum much lower than your belly button. Child should be snug against you and not swinging. 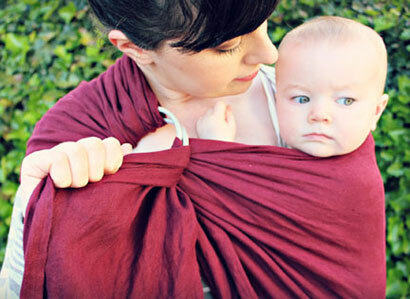 If child does not feel secure in the ring sling, it needs to be tightened. Don’t wear baby in reclined position unless nursing. Tip 2: Check the tension and position of the top rail for the ring sling, for both safety and comfort. Do Keep the top rail snugly against you. 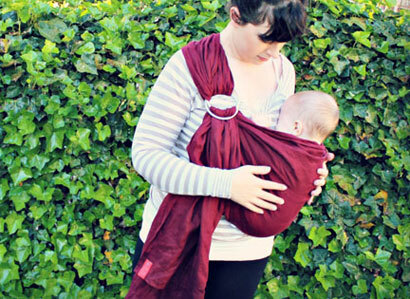 This keeps baby securely in the carrier and is also more comfortable for your body. Keep the top rail high behind baby’s back. Older babies and toddlers may prefer to have arms out. Don’t leave so much slack in the top that the baby is leaning away from you. This is unsecure and also will cause strain on your body.If your sling is padded and you can’t tighten the rails as far as you need to, we recommend another size sling! 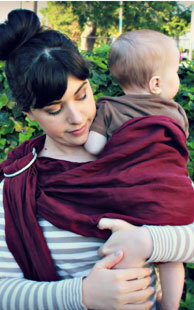 Tip 3: Keep the fabric of the ring sling spread around the rings to make tightening easy. 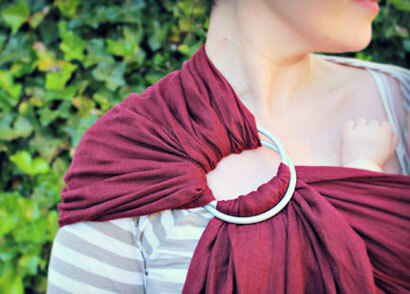 Do Tighten the top and bottom rails of the ring sling separately by pulling just the fabric in that area. When you tighten the top rail, pull up and over across your body. Don’t pull down on the entire tail of the sling at once. This can cause the fabric to twist up in the rings and make it harder to move easily through. Tip 4. 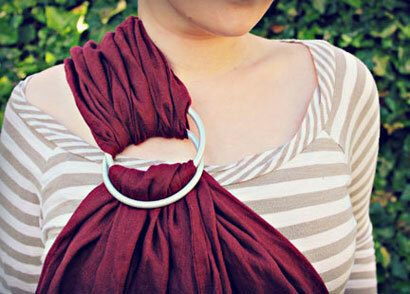 Center the fabric of the ring sling over your shoulder. Do Spread the ring sling fabric as much as you can across your shoulder (many people even pull the fabric down the arm). Generally having the fabric centered over the ball of your shoulder is most comfortable. If over the course of wearing your baby, your neck and shoulders begin to hurt, re-spread the fabric, pulling it down and away from your neck. Don’t let the fabric of the ring sling bunch up towards your neck. 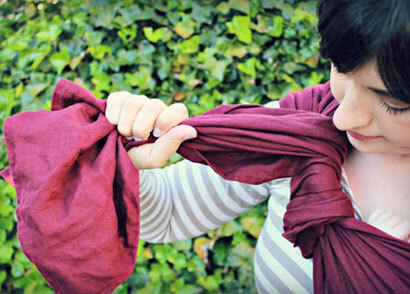 Having a narrow, bunched band of fabric causes strain on your neck and shoulders. This is a very common source of neck, back and and shoulder pain with ring sling wearing. 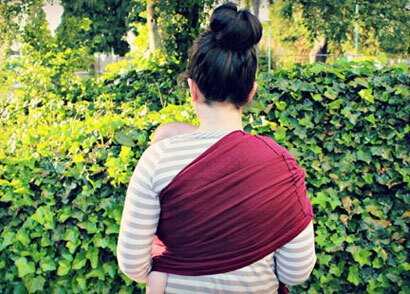 Tip 5: Spread the ring sling fabric widely and evenly across your back. This distributes your child’s weight more evenly across your body making wearing much more comfortable for a longer period of time. 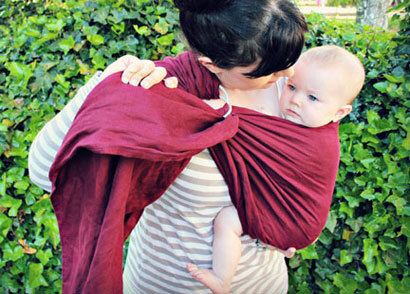 Do If over the course of wearing your baby, your shoulders and back begin to hurt, re-spread the ring sling fabric: first reach behind over your shoulder to pull up and then reach down behind your waist to pull it down The lower on your back you can spread it, the more comfortable it will be! Don’t forget to spread the fabric out after putting baby into the carrier. 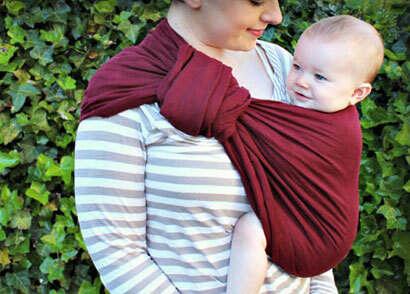 A ring sling that is bunched up in back, or has twisted fabric causes pressure points and back strain. You may not notice the strain right away, but you will after some time wearing. Tip 6: Check your baby’s leg position. When carrying baby with legs out of the pouch of the ring sling (in the hip carry or tummy to tummy position), her legs should be wrapped around you, with baby’s knees up and her bum lower or at the same level as the back of her knees. Legs should be parallel to the floor, or angled up. Do Pull the ring sling fabric up and under her knees. If there is extra fabric, bunch it up behind her back rather than under her knees. If you find her legs slipping down, grab them by the knees and give them a good yank upwards, then bring the fabric underneath and up to the knees. Don’t let the baby’s legs dangle straight down. This is not secure and can cause pressure marks on her legs.Don’t bunch the fabric under your baby’s knees. This can cause pressure points, red marks and impact circulation. 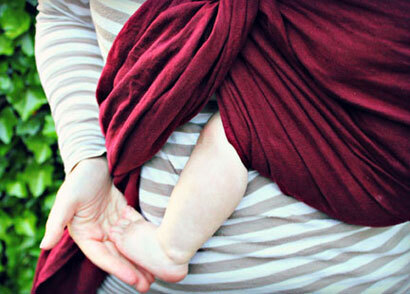 Tip 7: Get the ring sling on your body and tightened as much as possible before putting the baby in the sling. The less you have to adjust the sling after putting baby in, the easier it will be to get the right fit. 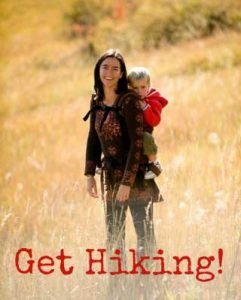 Do Adjust the main pocket of the sling before you put your baby or child in. Just leave the top rail a little loose until baby is in the sling.Do Loosen your sling just slightly when taking baby out. Leave your sling in position as much as possible when taking it on and off (just slip it over your head). That way you will only have to make minor adjustments to it each time. Don’t Put the baby in when the sling is all the way down around your belly button. Baby will be less fussy and you will be less stressed if you get sling close to its final position before slipping them in!Don’t Loosen the sling a whole lot when taking baby out or when taking the carrier on and off. This just makes more work for you later! 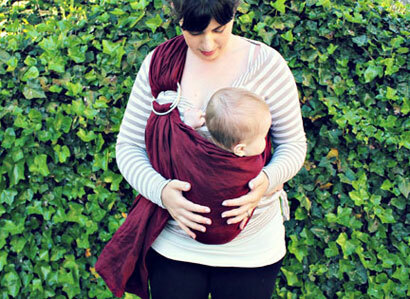 Tip 8: Take baby’s weight off the sling when you want to make big adjustments to the fit or position. Make tightening the tail the very last thing you do: think in terms of wrapping the body of the sling around yourself and baby and drawing it snug behind baby’s legs and back before you pull on the tail. Do Put your hand under his bum and lift him up while adjusting the sling with your other hand. Keep supporting baby’s weight with your hand while pulling the tail so that the fabric moves easily through the rings; you are just bringing the loose fabric through the rings, with no pressure on it and no change to the adjustment of the sling body. 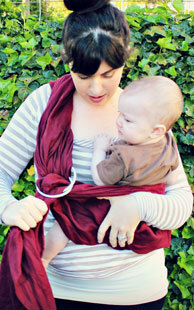 Don’t try to make major adjustments to the sling while the baby’s weight is fully on the fabric. It is very difficult to properly adjust a sling this way.Don’t just put baby in the sling and then try to yank on the tail to do all the adjusting! Bonus Tip: Wrap the tail around the rings for a sleeker, more minimalist look (great tip for dads, too). This is also helpful when you want to protect a little head from hitting the rings. 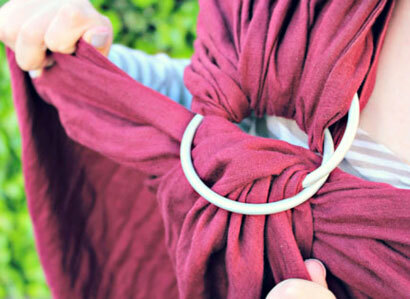 Do: wrap the tail around the rings if you prefer a more minimalist look or don’t like fabric hanging around your body. 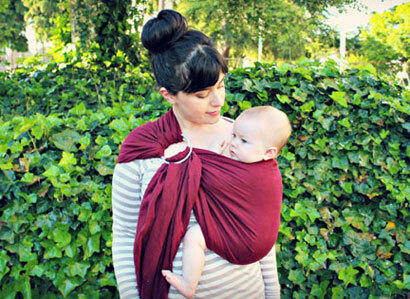 Don’t wrap the tail if you want to use it for a sun shade or breastfeeding cover up! Huge thanks to our model Jill and her husband Justin (who took the photographs): Jill is an avid babywearer, instagrammer and blogger, formerly of Goodnight Mush. 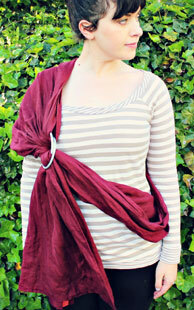 Jill is wearing a Sakura Bloom Pure Linen Ring Sling in Plum. 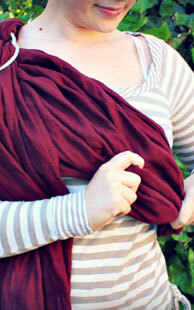 This is a single layer linen ring sling. Again, if the sling you are using makes it difficult or impossible to adjust so that you can achieve the pictured positioning, please consider getting a new sling!